Guys...This is a contest NOT to miss! 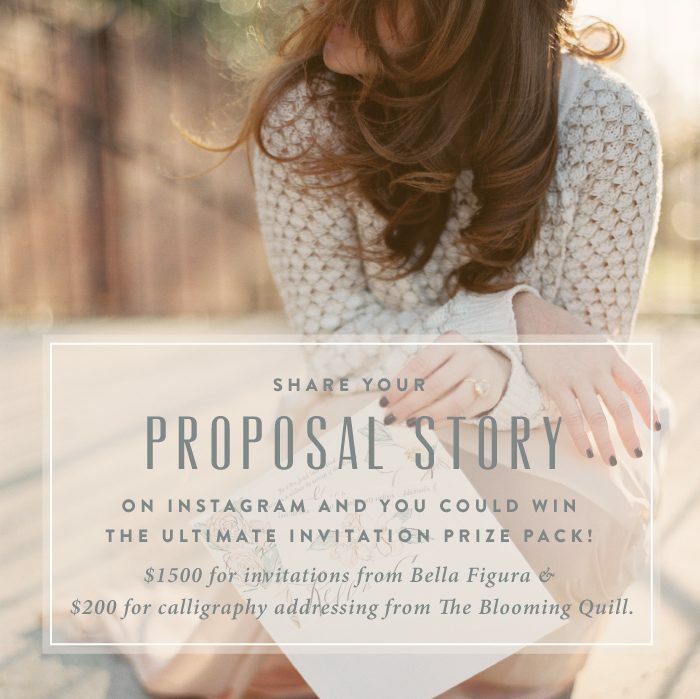 SHARE YOUR PROPOSAL STORY AND WIN THE WEDDING INVITATIONS OF YOUR DREAMS FROM BELLA FIGURA + THE BLOOMING QUILL! Did you get engaged on Valentine’s Day? Perhaps your proposal story took place over the holidays. Whenever it happened, we want to hear about it! Share your proposal story with us on Instagram using the hashtag #ourproposalstory. The editors from 100 Layer Cake will help us choose one lucky couple for an incredible grand prize: $1500 for your Bella Figura wedding invitations, plus $200 for calligraphy addressing from Debi Zeinert at The Blooming Quill! Submit your entry by March 10, 2015 to be considered for the grand prize. Not sure what to share? Be creative! You could show off a photo of your engagement pictures, the spot where got engaged, a fun candid of you and your significant other, or any image that embodies you both as a couple. In the caption, tell us about how it went down – we want to hear your stories! The fine print: entrants must follow Bella Figura (@bellafigura) and use the hashtag #ourproposalstory on Instagram to be eligible for the grand prize. Grand prize consists of $1500 from Bella Figura, to be used on a custom stationery order, plus $200 for calligraphy services from Debi Zeinert of The Blooming Quill. Post must be publicly viewable on Instagram to be eligible. Entries must be received by March 10, 2015 to be considered for the grand prize. This contest is in no way sponsored, endorsed, or associated with Instagram. Winner will be announced by 3/13/2015. Winner will be notified via direct message on Instagram. Grand prize must be redeemed by 3/15/2016.